Aztec culture and art was rich in symbolism. One of the foremost reasons for this use of rich symbolism was that the Aztecs lacked a written script for their language and thus they had to resort to drawing for the preservation and transmission of knowledge and information. This drawing not only showed the artistic aspect of the Aztecs but also provided a scope for the incorporation of Aztec symbols in particular the religious symbols since religion influenced almost every important aspect of the lives of the Aztec people. Aztec symbols incorporated into art and architecture, just like other aspects of the Aztec culture, were heavily influenced by the previous Mesoamerican civilization, in particular the Toltecs. This was a group of people who’s city-state was destroyed in 1168 and who had previously created impressive art and architecture. The Aztecs were so impressed by the Toltecs that often the ruling family traced their lineage to them. Further, the works of art in Aztec Empire were called “toltecat” after the Toltecs. 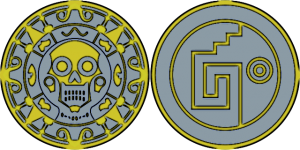 Thus Aztec symbolism had influences of the previous civilizations but there were various unique Aztec elements as well. There were a variety of Aztec symbols incorporated into various elements of their culture. For instance, there is rich symbolism is their codices consisting of religious drawing including the drawings of various gods and Aztec symbols for their powers depicted as various animals. A very important work of Aztec symbols is the famous Aztec calendar which details the Aztec symbols for days along with their calculation for both solar and sacred calendars. Additionally, Aztec architecture is also rich in symbolism and they took particular care to incorporate religious symbolism in the construction of their temples and pyramids. The incorporation of Aztec symbols in art and architecture was never without meaning. For instance, in Aztec art, various animals were depicted as Aztec symbols for gods and their powers. 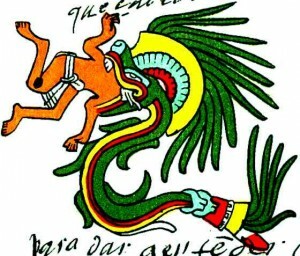 For example, the god of maize Centeotl is depicted as having ears of maize, the god of death Mictlantecuhtli is depicted as a skeleton with bloody spots, the god of fire is shown carrying a serpent of fire on his back, and so on. War was of utmost importance in Aztec Empire since it was a military empire and rich symbolism was incorporated in the costumes of their elite warriors, the eagle and jaguar warriors who donned costumes like eagles and jaguars which were thought to give them the powers of these animals. Aztec symbols were used for the names of Aztec emperors as well as their costumes. For instance, Moctezuma I was one of the most famous Aztec emperors who considerably expanded the Aztec Empire and consolidated its ideological foundations. His real name was Ilhuicamina which means “he who shoots an arrow into the sky”. Costumes used for Aztec emperors symbolized the grandeur and powers of the emperors and thus common people were not allowed to use those costumes or even those colors. During religious ceremonies and festivals, emperors participated by wearing special kinds of masks which were thought to give them godlike powers. Aztec religion was based on rich mythology and symbolic meanings were associated with deities and geographical places. For instance, according to Aztec religious beliefs, places like caves and mountains symbolically represented the places of crossing between the upper and the nether worlds. Similarly, the four cardinal directions were associated with the religious layout of the world and each direction represented specific gods and colours. During religious ceremonies and festivals, priests and emperors wore costumes which gave them resemblance with the Aztec gods. Aztec symbols were closely related to Aztec gods since different symbols were used to represent different gods and the powers associated with them. Different symbols for gods included the symbol of flower for the god of dance and storytelling Huehuecoyotl and the symbol of rabbit for the goddess of fertility Mayahuel. Additionally, the numbers on the Aztec sacred calendar also signified different gods. For instance, the god of maize Centeotl is represented by number 7 and so on. In architecture too, a variety of Aztec symbols were incorporated to signify various religious and cultural concepts. Other than incorporation of beliefs, symbols were also used to add decoration and style in architecture. For instance, in an Aztec temple reserved for a certain god, abundant use of symbols associated with that specific god was used. Among the popular Aztec symbols in architecture, the symbol of eagle was used to represent the sun and the warriors, symbol of serpents for representation of water or fire, and the symbol of conch shell for representation of fertility. Frogs and sea creatures were often used as symbols for Tlaloc who was the god of water and rain. In language and communication, Aztecs often made use of Aztec symbols in the form of drawings since they did not have any written script. Due to the absence of written script, historical events, religious instructions, and other forms of information were transmitted through drawings and thus different kinds of Aztec symbols were used for different kinds of things and events. One of the most important Aztec symbols in Aztec writing is the symbol of conquest. In this particular pictogram, an Aztec warrior is represented capturing another warrior with the temple of the enemy city-state in the background, toppled over and burning. This imagery is the representation of the conquest of the Aztecs over some other city-state. Aztec society and culture was rich in symbolism and abundant use of Aztec symbols was included in art, culture, and architecture. Since the Aztecs did not have any written language, they conveyed information and knowledge through pictograms and logograms. These drawings made rich use of Aztec symbols since different symbols were used to signify different concepts and events. Aztec symbols were also frequently employed in architecture, particularly the architecture of the temples and the pyramids. It was also common to use different animals as symbols to represent different gods and their powers.